I love doing hairstyles on my little girls! 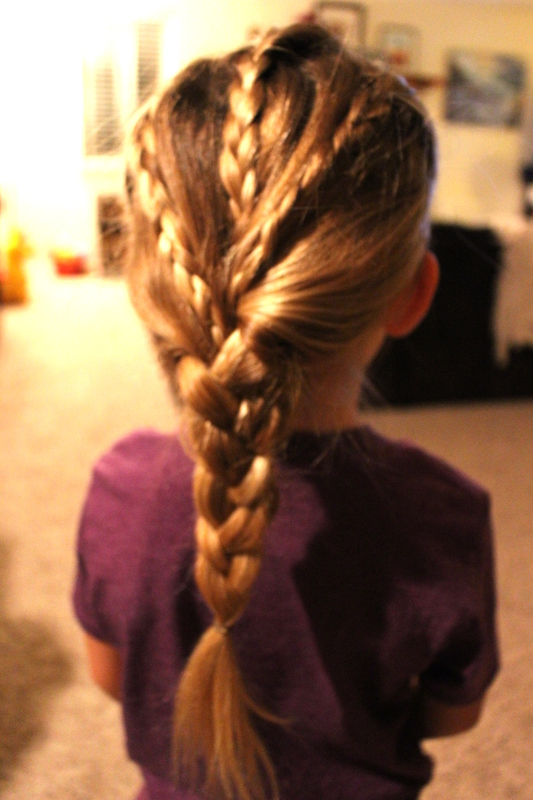 My oldest daughter’s hair is so long that it is fun to try some really neat braids, buns and twists. All of these were done in about five minutes from start to finish. It is amazing what you can do with just a few minutes. I think most of these would look good on girls and women of any age. I used plastic elastic rubberbands and a few bobby pins. Here are some tips for each of these hairstyles. The side twist + side pony started out with just one piece of hair gathered from the front right side of the head and placed into a pony with a small plastic elastic. Split that small pony in two and hold aside, pull up another piece of hair from the side front of the head and secure in another elastic. Wrap those two sections around the second pony. I know that sounds a little complicated but once you’ve got it the rest is a snap. Take a minute to reread that if you need to. After you’ve gotten the second pony wrapped with the original pony you split in two, simply twist the two bunches of hair all the way across the head. At the ear, gather all hair and the twist into a side pony and secure. That’s it! This would look beautiful for a formal event if the side pony was then curled. The fish tail braid is so unique, I really love it for it’s orderly look. This hairstyle starts out with a side pony with all hair except a 1-2″ section of hair opposite the side pony. Secure the pony and wrap it with the left out section of hair, secure with a bobby pin at the bottom of the ponytail so it doesn’t show. Next, start your fish tail braid all the way down the pony, at the end secure with an elastic. 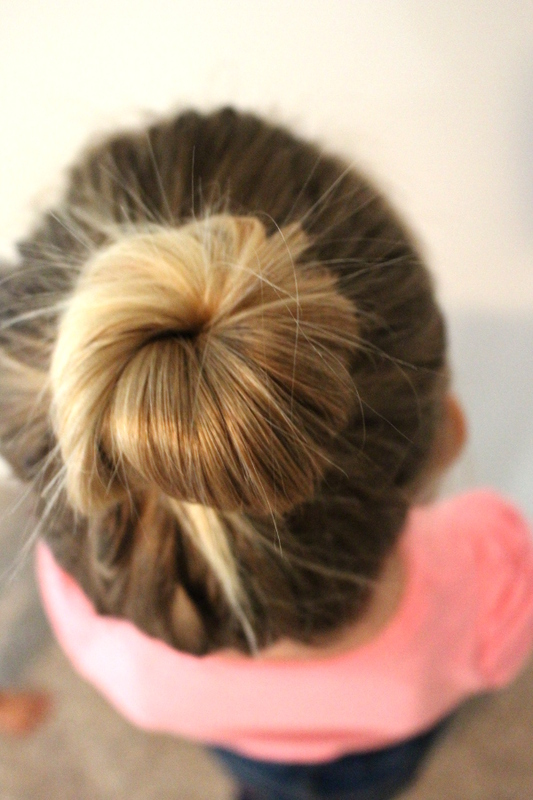 The ballet bun is so simple and really one of my go-to hairstyles for my daughter during the school week. 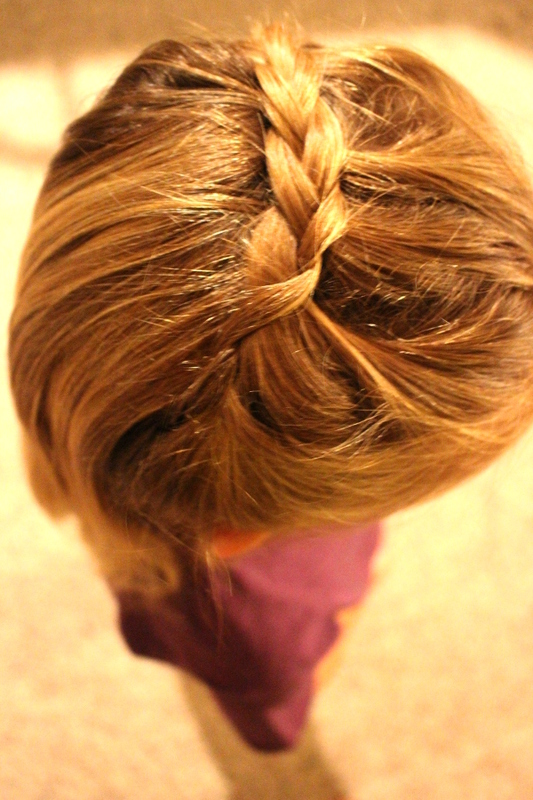 She is so active and this hairstyle is so easy that its a good choice to keep her cool at school. 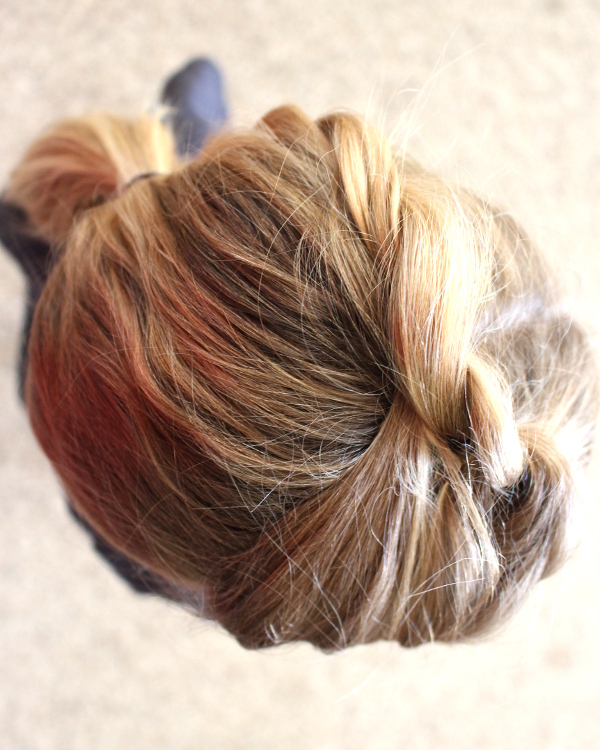 To make a simple ballet bun, gather all hair into a high ponytail and secure with an elastic. Simply twist the hair around the base of the ponytail while simultaneously twisting the ponytail. The extra twist of the ponytail while circling the base of the ponytail helps it to fall in the beautiful, even way. Secure with an additional elastic and bobby pins at base if needed. This hairstyle was fun to do on my daughter and it frames her face nicely while keeping hair out of her face so she can play. 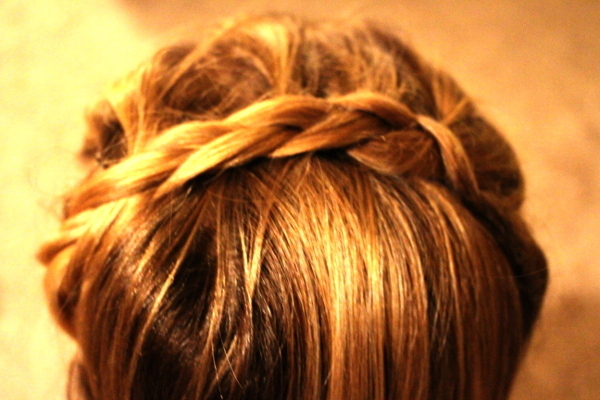 Start at one ear and begin making a french braid across the head. The difference with this hairstyle is within the french braid, you only add hair to one side unlike a traditional french braid; in this case you add the hair from the front of the head only. Secure at the other ear with bobby pins and make sure to keep tight throughout the braiding. Lastly, this hairstyle I figured out recently is my new favorite! So pretty I think. Start at the top of the head and make three evenly spaced, small braids that pull hair from the very front top of the head. Braid to their length and secure with elastics. Simply divide all hair into three sections with one small braid in each section and braid the length of the hair, secure with elastic. 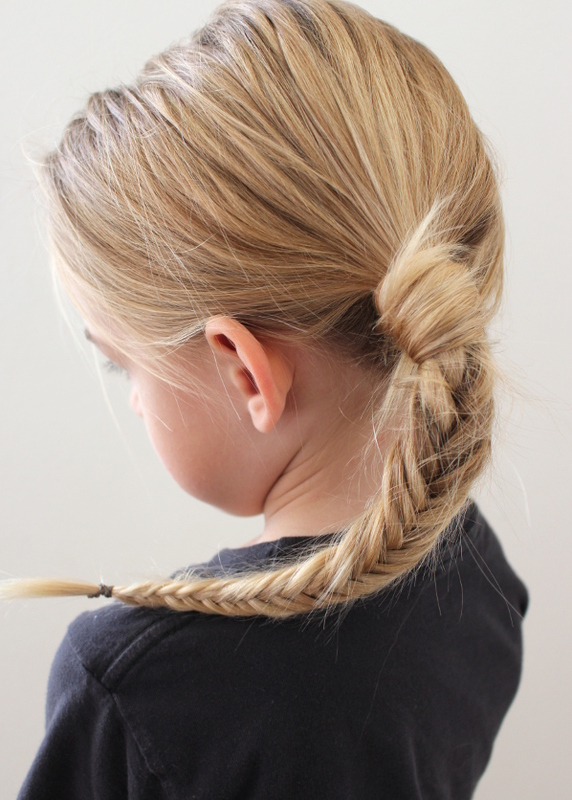 So there we are 5 pretty hairstyles for little girls! Feel free to ask questions in the comments. I’m curious which one you like the best as well…..